From the head coaches to the youngest members of the Class of 2019, every individual on the team works together to get to know each other and prepare for the upcoming competition. This year’s early season has seen encouraging results for the women’s soccer team — a 3-1-1 record, marked by a win in the season opener against Marist College, a 6-0 routing of the University of Vermont in the home opener and healthy challenges against high-caliber teams on a trip to Nashville, Tennessee. The early season was rounded out with a victory over the University of Albany, a tie against the University of Memphis and a loss to Vanderbilt University. Team co-captain Lucielle Kozlov ’16 has showed an impressive start to the 2015 season, earning Ivy League Co-Player of the Week after netting four markers in two games to bring her points thus far to 10. Last season she garnered a team-high 12 points on five goals. Alongside the senior member, the freshest faces have also performed well, with Remy Borinsky ’19 starting every game and Lauren Lucas ’19 making a difference off the bench, scoring the Big Green’s only goal in the game against Memphis. On the training pitch, the team has been working hard and doing a good job of incorporating his staff’s coaching into their play, Rainey said. And in games, the team has continued its perennial defensive strength, earning three shutouts and staying organized under pressure even in the more challenging Nashville games, Rainey said. Kozlov was equally optimistic after the big win. The mentality going forward, Kozlov said, will be to keep up the good work on defense and to work to create more chances on the offense. The team will also continue to rely on the entire squad to generate the attack, as they did against Vermont. The team has also showed itself to be a cohesive group thus far, an important factor in soccer. Lucas agreed, saying that she appreciated the team’s good chemistry and that there was a diversity of viewpoints among members. 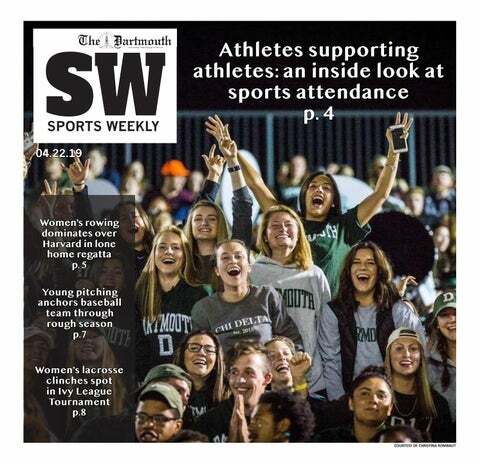 Dartmouth took second in the Ivy League last year, yet the women tied as many games as they won. Harvard University had an easy lead on taking the Ivy title, with a 5-1-1 record against the Big Green’s 3-1-3. Offense will be key if they wish to earn an NCAA bid this year. The Big Green will also need to stay healthy. The team will depend on first-team All-Ivy performers and team co-captains Corey Delaney ’16 and Jackie Friedman ’16, but Delaney has already missed games due to injury. The women’s team hits the road again to face Northeastern University Friday at 6 p.m. and will return home to face Sacred Heart University on Sunday at 1 p.m.